The Southeastern Vermont Bicycle Map is a project of the Windham Regional Commission. This map series provides information about roads in the Windham Region, including traffic volumes, shoulder suitability, steep grades, bike shops, cycling opportunities, and cycling hazards. The maps should help cyclists understand the types of conditions they may encounter on these roads and choose appropriate cycling routes through the region. While primarily for "road" cyclists who do most of their riding on paved roads, all roads are shown on the map, and those unpaved roads that may be of interest to road cyclists are highlighted. Currently, Map 1, southeastern Windham County (Brattleboro, Newfane, Putney area) iwas updated and made available in the of Fall 2011. 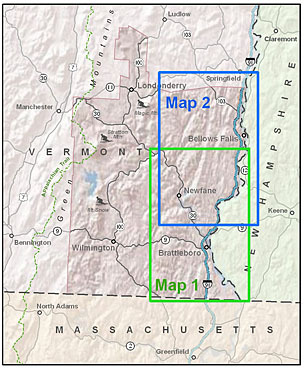 Updates for Map 2, northeastern Windham County (Bellows Falls, Westminster, Grafton area) are complete, and as of June 2012, this map is now available! Maps 3 and 4 will be released as time allows. For more information on the map, contact WRC GIS planner Jeff Nugent. Are you looking for suggestions on bike rides in the Tri-State region this summer? Then check out the Connecticut River Scenic Byway Bikeway Routes map, which covers parts of three states and shows bike routes from Putney, VT and Walpole, NH in the north to Easthampton and South Hadley, MA in the south. The map was prepared by the Franklin Regional Council of Governments in Greenfield, MA in cooperation with the Massachusetts Department of Transportation and the U.S. Department of Transportation. The Windham Regional Commission (WRC) in Brattleboro contributed data for the Vermont portion of the map, which shows easier, intermediate, and advanced bike routes, off-road bike trails, bike shops, picnic areas, ice cream stops, and more. Copies of the map are free. In Vermont maps are available in Brattleboro at the Brattleboro Area Chamber of Commerce, Burrows Specialized Sports, Brattleboro Bike Shop and the WRC offic, in Guilford at the Vermont Welcome Center on I-91, and in Putney at the West Hill Shop. In the spring of 2011, WRC collaborated with the Town of Dover to create a map of the Crosstown Trails system near West Dover, on land owned and managed by Mount Snow. The map can be found on the Town of Dover's web site by clicking here.